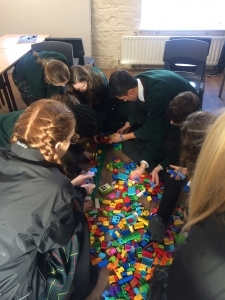 Bricks 4 Kidz was a fun Business and STEM related workshop that helped 5th year students to develop problem solving and critical thinking skills. Students had to communicate and work together in a creative manner using Lego Technics, robotics and Mind storms. This workshop was a huge success and was all thanks to Hugo Collins and former student George O’ Carroll for winning the Drogheda Young Innovator Competition 2018.